The author of this post is Tom Litjens, one of Austin Adventures’ guides in Europe. Visiting the Alps by foot and by bicycle sounds like something for seasoned bikers and hikers, doesn’t it? That’s what I was thinking the first time that I heard about Austin Adventures’ Italy: South Tyrol and The Dolomites tour. So when I was asked to guide this tour, I prepared myself for some heavy biking and wondered if I would be fit enough to do it. After all, I am from the Netherlands, and I’m not used to mountains, let alone hills! I was working with two other guides, who had done this specific tour several times, and they found some pleasure in letting me worry about the difficulty. Now, I know they were just smiling at each other behind my back. The bike ride starts near Burgeis and Lake Reschen where we’re surrounded by the high mountains of the Alps. 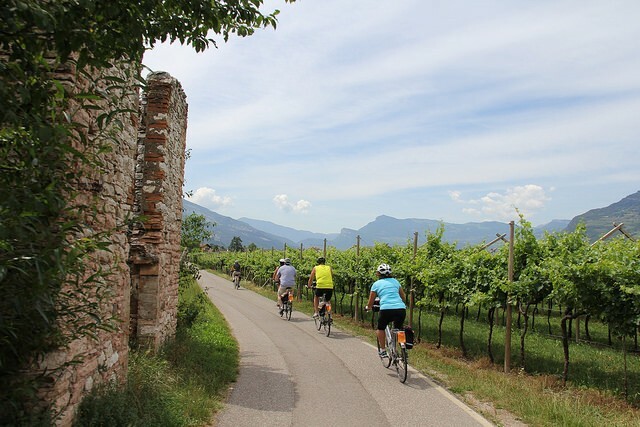 After getting on my bike and starting to ride to Merano, I found out that this trail followed a valley (and the Etsch/Adige River) and went through little mountain villages after passing by orchards, meadows and some very scenic countryside. The entire time, you have the mind-blowingÂ background of the mountains, but the real beauty is that we didn’t have to climb any of them! Although South Tyrol is a province in Italy, Italian is only the second language, since the main language in this part of Italy is German. But as we make our way south in the direction of Bolzano (or Bozen in German) we can also see that everything slowly gets more and more Italian. In South Tyrol you will actually get the best of both worlds: culture, food, and people. It’s the mixture of all of these things that makes it one of my favorite destinations for my personal vacation time. The bike trail, and, by the way, some people do it reverse. Now that”™s a climb! The mountain villages””each one has its own individual personality and character. The town of Merano, where you can shop, relax at the local spa (therme in German), enjoy culture, visit the amazing Trauttmansdorff Castle Gardens AND you have many hiking and biking trails all within walking distance. The South Tyrol Museum of Archaeology in Bolzano where you can see the remains of Otzi, a man who lived 5,000 years ago. His body and garments have been preserved in the ice of a glacier! All of the above combine for a very adventurous holiday….